I am a student of the “Red Building of Dreams” where the number of dreams realized per square foot is the highest. FMS is the oldest Management School in India and therefore a number of great leaders have walked out of these gates. We are at the heart of the Nation and the National Capital. This gives us an opportunity to be a part of great events, debates, represent our views on national television and also be a part of live projects. This kind of exposure is unparalleled. All of us live within 2 kilometres of the campus and we have a variety of food chains nearby. Having a batch size of nearly 200 students, one more big advantage would be the strong bond between all the batchmates. The smaller the batch, the better is the friendship. 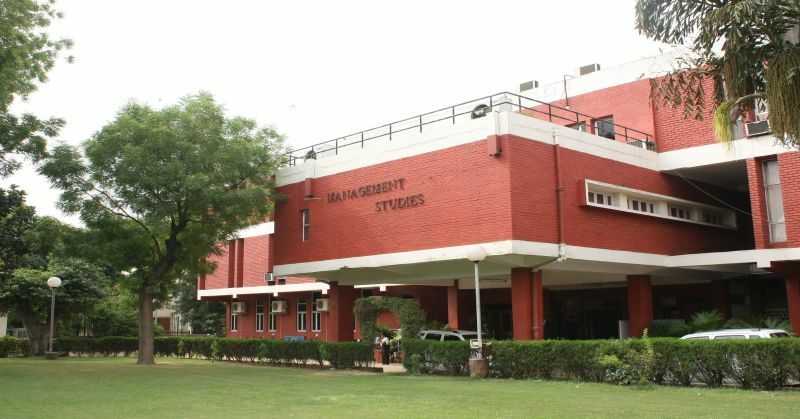 People generally tend to forget that FMS is a part of the Delhi University, and we have the entire infrastructure of Delhi University at our disposal. Because of fewer resources, we learn to yield high outputs with whatever we have and therefore even in real life we can give the best results with minimum inputs therefore we make the best leaders in the industry. We have such renowned faculty and a very strong alumni base, which adds to the value of FMS. Lastly, after 2 years when we walk out of the gates of this Red Building of Dreams, we can pursue whatever we want without having to worry about a 20 lac loan repayment. My campus is the most unique campus and therefore the students of FMS stand out in every field. In my 2-week tenure in FMS, the most memorable experience I had was on the 5th day. In the first day, we were all getting to know each other and forming opinions about everyone. We had formed a certain image of each of our classmates. Then, on the 5th day we had a class where the professor asked us to introduce ourselves. She asked us to tell everyone who we really are and not just state our academic and work profiles. When everyone started introducing themselves, it felt as though the room was filled with colours. Everyone had a different hobby, a different story, a different shade of colour. Some said they like directing plays, some were dancers, singers, painters. The room was filled with so many different personalities, and all the images that we had formed about each other shattered one by one. So, getting to know my classmates that day and learning an important lesson was the most memorable experience in my B-School journey till yet. Vrinda Bhatnagar – She is a chocolate lover. Get her a brownie loaded with ice cream and chocolate syrup and you can see whole new Vrinda then. She laughs uncontrollably, a chatterbox and cracks the lamest jokes. One of the incidents as quoted by her was when she, along with her group of girl-friends, walked down the entire market lane distributing free hugs to strangers, talking about random stuff, being who they are without any filters and making the most out of the one free hour they stole from the busy schedule by bunking the last lecture at school. Avinash Yadav – The ‘sleeping beauty’ of our class. He could sit right under the professor’s nose and still go to sleep. When caught, he often pretends that he was in some deep thoughts and somehow he always knows what the professor was teaching while he was asleep. Being a bike enthusiast, the one covered 400 kms in a single day. He is also a music lover. Eeshan Anshul – One of the most enthusiastic students of our batch, Eeshan loves to travel. He was working in Bangalore before joining FMS and used to go on a lot of trips with his friends. One such trip was when he and his friend had planned a trip to Kodaikanal. They booked the tickets, accommodation etc. On the day of the trip, the group size increased from 2 to 10. They had just 2 train tickets and one room to stay in. It was a busy season so they did not get any other accommodation. And they had one hell of a trip. Anubhav Katharia – The shy and sincere guy of our class also has a crazy side to him. He loves to ride a bike and has rode on the hills of Himachal where the temperature was negative and the conditions were hypothermal. He has also once slept beneath the Eiffel Tower in Paris. I would want to work for Aditya Birla Fashion and Retail Company. I love apparels, fashion, shopping and I have been a consumer to this great segment, now I would want to experience the ‘behind the curtains’. After the eCommerce boom and big brands like Zara and mango entering into the Indian market, the fashion and retail industry has become very challenging. To understand the customer behaviour in the retail industry is very difficult. Market is a small word, but has a number of dimensions to it. Therefore, the retail customers and the huge and complex market are two things that challenges and excites me. This is the reason why I would want to be a part of the Aditya Birla Fashion and Retail Industry.